This is where I have combined photos that fans have sent in and their stories and comments on the site. If you have anything that you would like to add, just email me and I would be glad to add it to the site. My best Dale Eanhardt memory is when I took the trip out to New York to watch the race from Watkins Glen. I took Friday off and wanted to see everything, so qualifying was great to see. Dale was all bruised up from the wreck at Talladega. Broken collarbone and sternum, etc. He had a back-up driver all ready just in case... David Green? So there I was at the return road after turn 1 taking pictures of the cars as they qualified. There had been a lot of talk among those present about how poorly Dale had been racing... 50+ races w/o a win. As a fan I was worried, but felt that whatever happened was meant to be. So when his car went through the finish line a huge yell erupted out of the grandstands. He was close to the last qualifier. 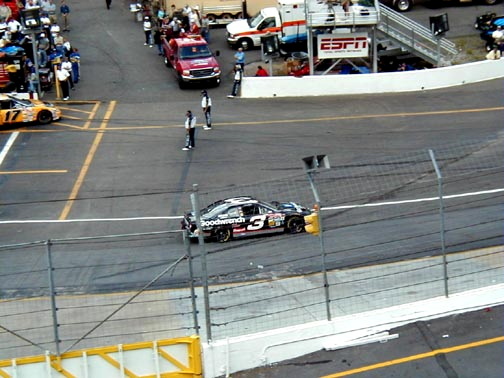 I looked up at the scoring pylon and the #3 was on the top and stayed there! He also set a new track record. I ran back to Victory Lane and from behind the fence I saw him get the Bud Pole Award. He was walking funny, stiff and with a limp. Later they would sell t-shirts that commemorated the pole, "It hurt SO good!" he was quoted as saying. 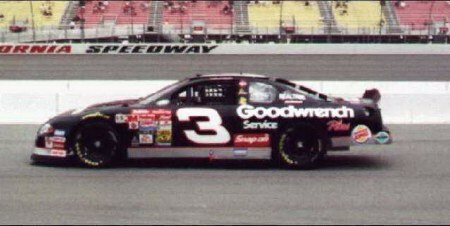 The day of the race no relief driver was needed, Dale went the distance in a lot of pain, Geoff Bodine ended up winning... but to me the real winner was the legend who stepped up, pain and all, and did what had to be done. It would be two years later that I'd be near Watkins Glen again, in Ithaca at a place that did not have cable and only got Fox from Syracuse, before they had the TV deal. So there I was listening to the 1998 Daytona 500 on the Motorsports Radio Network, biting my nails toward the end. Dale was in the lead nearing the last lap when there was a caution... he was finally going to win the Daytona 500! I cried that day, and much more again this year...What a race. GM Goodwrench Car @ California Speedway during the 2000 Season. My memory that touched my life is from June of 1997. My brother, Thad Berryman, got his dream to come true when he got to meet the intimidator himself. See, Thad has cerebral palsy. 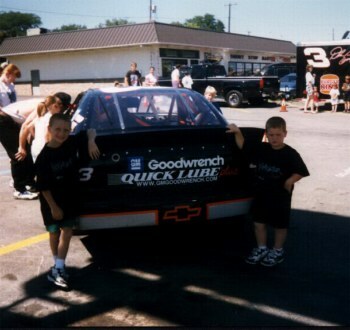 Even though they had never met before then Thad said him and Mr. Earnhardt were buddies. 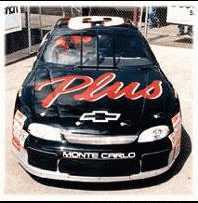 Mr. Earnhardt came out of the back room, T.V. news people & camera's everywhere. He answered a few questions then looked at Thad and said,"I've got to get over here and talk to my buddy." Someone from the Chevy Dealership in Memphis, Tennesse had told Mr. Earnhardt about Thad. He signed several pieces Thad took. But then he signed his caps, shirt, flag on his wheelchair. The smile on Thad's face I will never forget. Thad would have typed this but he can't type on the computer. We want to thank you for your time. COMMENTS ON THE LAST MEMORY: Thanks for your story... it brought tears to my eyes and gave me chills. I find myself sifting through Earnhardt pages and stories almost every day, and today is no exception. 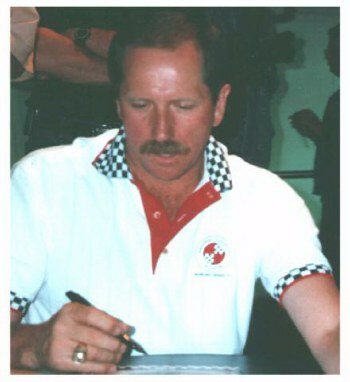 Your shared memory reflects the humanitarian side of the Intimidator that really went unrecognized before his death. Its a shame that more didn't realize what you and I knew a long time ago. 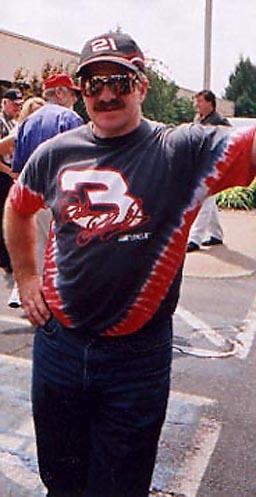 Dale at the Bristol Spring Race 2000. COMMENTS ON THE LAST MEMORY: Yes I know what what you are talking about. I met him just before he won his last race at that 2.6 mile track in ALB. I do not know how to spell it but you know what track I mean. I waited for 9 hours before he signed a origenal photo of him. 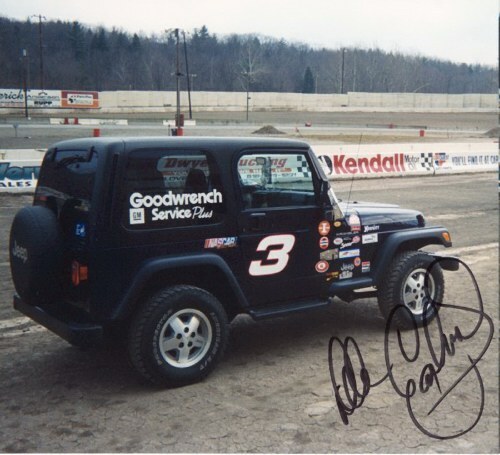 The photo is him sitting in the #2 wrangler car in the dayton infield. 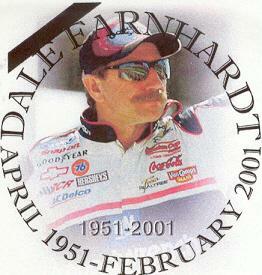 I saw Dale in March of 1997 at the Corvette museum in Bowling Green, Ky. I heard about it that morning and took off of work and drove up that afternooon. We waited for over 6 hours to get the autograph...when Dale arrived...he did not sneak in ...he walked right thru the crowd and even shook some hands on the way...I showed him my #3 car tattoo then..he said "that's great". After waiting in line forever...I finally got in to get my autograph...I put my arm out and said what about this.. He said "what about it? "..I then asked him to sign it so I could have it tattooed in and he did... 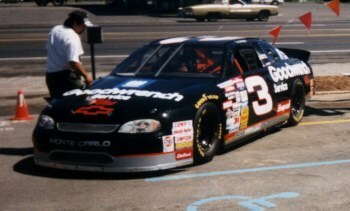 The Pics are on my site at www.intmd8or.com as well as other pics poems and links concerning Dale... There were over 6000 people there and Dale stayed till everyone got an autograph... Dale will be terribly missed...especially by this fan. It took me a long time to get to like Dale Sr. When I got into racing in '94 I was a ERNIE IRVAN fan. When ERNIE almost died in 94 I learned that Dale helped ERNIE a lot with his racing. So little by little I learned to like Dale. Soon,I liked watching him on tv and racing. In '94 when he won his championship he thanked ERNIE a lot also. So,as the years went on he just grew on me. For some unknown reason I watched a lot of speedweeks before Daytona,even though I should of been sleeping. I work nites 10-7am. I especially enjoyed when Dale took the announcers headphones and talked to Waltrip for at least 8 minutes. The ride he gave Terry Bradshaw was something else. Right after the crash,I told my son,something is the matter,Dale should of been getting out of the car to run up to almost 'yank' Waltrip's head off. The way he always did. I miss him terribly,like you. I just love HARVICK,and young DALE. They are really great. At a race,it's great to hear the planes to see the three fingers go up and to see DALE JR and HARVICK and PARKS and someday again Mikey do their best. I know that Dale is so proud. I just feel it was his time to go,go out with dignity and be praisd for the great man that he is.!!!! DALE JR did his Daddy proud at Daytona. 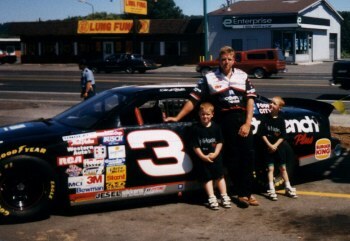 You could almost feel Dale's presence with him,and the kid feeling the wind just like Dad. 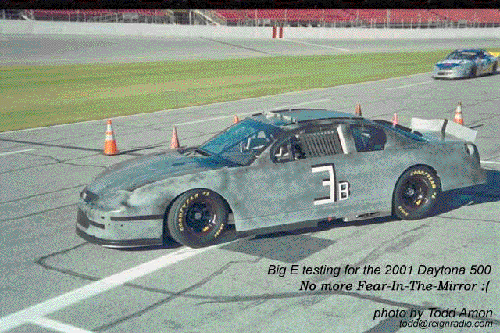 This pic is of the testing for the 2001 Da500, It is the "B" car that Dale actually drove in the 500 (before paint). I was there at the testing and the 500 in the garage area. 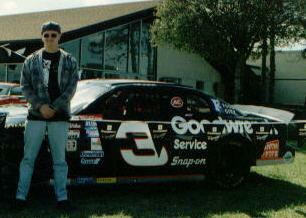 This is my tribute to dale Earnhardt. You will notice that its autographed by Dale himself. This is not the copyrighted Autograph we all see, that is seen on shirts and such. I sent this picture to Dale and waited a long time to get it back,and sure enough it came back with his real signature.I was so happy to get it just before the Daytona race. Now its a real treasure to me because its my Jeep,and my rolling tribute. Ok ya'll. My husband had told me about a guy who lives in NC that looked alot like Dale Earnhardt. I figured, sure, he looks something like him, but he couldn't LOOK like him, well, here is Marcel, you tell me what you think? Special thanks go to Marcel for allowing me to post this pic. Thanks Marcel! In a way, it seems like it's been a long time since Dale has passed. In another way it seems like only moments ago. I started watching Nascar tape delayed in the early 70's when I was only 10 or so. No one in my family watched, but there was something that drew me in. I pulled for the Allisons, Cale, Bennie, Neil and others. I remember watching a short track race where this guy, coming from behind was driving a ill handling car so hard he was smoking the right rear tire in every corner. It was the #3. I've followed Dale ever since. The loss I've felt over the last months is family like. I'm always going to be a Nascar fan, but there will never be anyone to me like Dale. To me, Nascar will not ever be the same. Dale will be missed as a husband, a father, and a close friend to even those of us that never had the chance to meet him personally. Dale created an unbelievable amount of excitement for all of us. He will always live in my memory.